Now that I'm starting to feel better, I decided it was time to start sharing some of my outfits that I've been wearing while I'm on maternity leave. I have to admit that it's not always easy to get yourself ready and put together a cute outfit to wear when you are taking care of a newborn. My days are mostly spent at home cuddling with baby Jack, but I have been taking the occasional outing just to get out of the house. Even when I'm just at home, I like to keep myself busy and stay productive. That's why putting on a cute outfit and getting ready helps me accomplish my goals for the day. I feel like no one ever talks about what to wear after you have a baby. 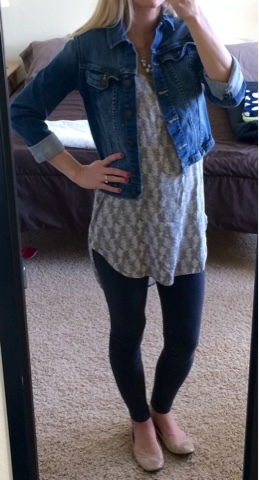 It's easy to find cute maternity looks on blogs, but why doesn't anyone ever talk about postpartum fashion? There is a lot to take into consideration when you are dressing your postpartum body. I knew that I'd probably want to wear comfortable clothes after my baby was born, but I didn't really give it a whole lot of thought. Basically, my stomach is still pretty mushy, I'm still wearing a belly band to help put my stomach back together, and then there are the challenges of dressing for breastfeeding. 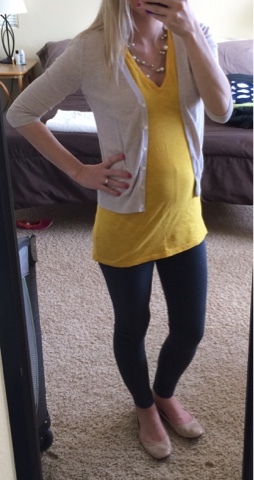 I've pretty much been wearing leggings with long loose fitting tops that are easy accesses for nursing. I've also wore some maxi dresses that are comfortable and are also easy for nursing. I've basically been wearing the same clothes that I wore while I was pregnant. Now they're nice and loose fitting, perfect for dressing my postpartum body. Here are some of the outfits that I wore last week. It definitely feels good to be out of my pajamas, but I'm looking forward to the day that I feel completely back to my old self. I'm looking forward to the day that I feel like I can have a normal routine, but for now, I'm just enjoying every moment at home with my little guy.